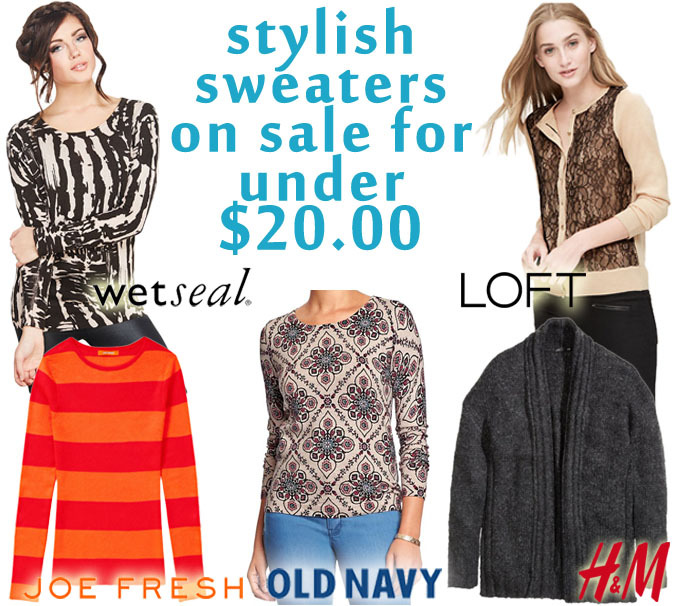 The Stylish Five: Sweaters On Sale For Under $20! What I love about this time of year is not only the varieties of hot chocolate, but the major clothing & accessories sales hitting stores to sell those winter duds to make room for spring & summer designs. My biggest must-have items are sweaters to wear not just for now, but definitely for next fall & winter as well. I sought out some of my favorite retailers to see the best deals on the most stylish sweaters. The best part is that each one is under $20! SHOP: abstract sweater ($19.99) @Wet Seal, stripe sweater ($13.96) @Joe Fresh, patterned sweater ($14.97) @Old Navy, shawl collar sweater ($10.00) @H&M, & lace cardigan ($15.88) @LOFT. These are perfect for wearing on cozy at-home snow days with fuzzy socks & some hot chocolate, when headed out for brunch in skinny jeans & ankle booties, or to the office in a pencil skirt & patterned tights. What’s your favorite kind of sweater? Are you a cardigan girl? Have you been shopping the big winter sales? For more stylish posts, check out how to wear an affordable statement necklace in 4 ways, Jennifer Lopez’s press your for The Boy Next Door, Natalie Portman’s Dior look for less, & the complete red carpet galleries from this year’s Critics Choice Awards & Golden Globes. Happy Styling! This entry was posted in Basics for a Bargain, Luxury Look-Alikes For Less, Quickie Darling Deal & Steal, Style Darling Daily, The Stylish Five and tagged affordable fashion, Basics for a Bargain, fashion, H&M, Joe Fresh, LOFT, Luxury Look-Alikes for Less, Old Navy, Quickie Darling Deal & Steal, shopping, Style Darling Daily, style for days, The Stylish Five, Wet Seal. Bookmark the permalink. ← Fabulous In 4 Ways: A Bold Statement Necklace For Under $12!